4 Can you Wear Suspenders With Belt? 5 How to Wear Suspenders Stylishly? Those long fabric strips adoring your torso are known as suspenders or braces in the fashion world. Commonly associated to men, girls to wear braces to get an androgynous and sassy look. Both comfy and classy, the main purpose of suspenders is to get a break from belts—but today most of the girls pull off suspenders just to get a unique and flattering style. Do you want to get a stylish look by incorporating braces? Knowing how to wear suspender is not enough; to get the best look, you need to know a passel of ways to incorporate this versatile accessory in your everyday look. Before we give a low-down on how to wear suspenders stylishly, it would be a cool idea to get a glimpse of the era where it all started off. When we talk of the history of suspenders, they are far older than the belts that we (male and female) use today. Suspender’s trend for men dates back to 18th century. They have been around, but in different forms—as a ribbon fixed with button holes or as an undergarment, the purpose was simply to hold up the pants. As far as ladies are concerned, it was in 1970 when women were officially introduced to braces. They wore it solely for office use (remember Annie Hall). It was after so many years that suspenders took the form of an established fashion accessory. Even today, girls are pulling off both casual and formal looks (for office attire) by adding this nifty staple in their everyday life. 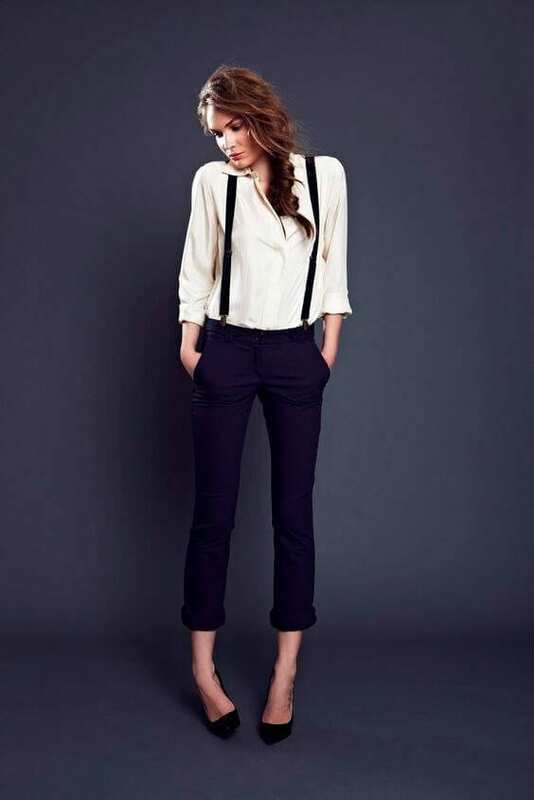 Most of the big brands produce unisex suspenders that can easily be worn by both genders. But before you pick one, there are some key features that you must consider as a girl. Unlike men, ladies come with narrower frames and slimmer torsos, so don’t get deceived by the size that seems right to your eyes. Sizes from 1-inch, 1/2-inch to 3/4-inch are highly recommended for women. For a delicate build like a woman’s, it is best to spend your bucks on skinny suspenders. Wearing over-sized braces would do nothing but ruining your overall look. How? Those large braces would become the focal point by distracting the attention from your upgraded (in your view) style. The color range of the dresses you are going to pair these braces with. Look of the day—Are you going to have a chic and sassy look? Then go with the braces available in fun materials and styles. For tailored and masculine-inspired look stay focused on muted hues with a flair of elegance. Season—for summer, handpick bright and lively shades to add a pop of pretty color, and for winter I would suggest you to go with elegantly dark hues. Suspenders around the waist come in two different styles—x-back and y-back. There are no gender-specific rules for it. You can wear any style that you like the most. To wear them perfectly, the first thing is to know the styles—usually suspenders come in two styles i.e. clip-ons and buttoned. Both styles come with their own pros and cons. It is up to you, which one do you pick and how you pull them off? Clip-on suspenders: This type of suspenders have metal clip attachments to keep the band intact with the trousers. These are not just easy to take on and off; they promise a saucy and fashion-forward look as well. Buttoned suspenders: This one is a traditional style that I always advise for more formal occasions. In this type, suspenders are directly attached to the buttons already sewn onto your trousers/bottom. Can you Wear Suspenders With Belt? This is a question that many of my readers have been putting forward regularly. The answer is NOT AT ALL. As both of these serve the same purpose (holding up the pants), so there is no need to wear them at a time. How to Wear Suspenders Stylishly? How to wear suspenders with jeans? This one is a million-dollar question—as suspenders are best worn with jeans. As you are about to get a casual look, handpick braces that are crafted in bold colors, amazing patterns and fun materials like denim and leather. Suspenders with shorts promise a sizzling look in summer. For the top area, tank tops or T-shirts are highly recommended. For colder days, incorporate a black tight underneath your shorts. Pairing up your favorite dress shirt with suspenders can bring you the hottest look. All you need is a cool dress pant, sparkling wristwatch and a pair of girly heels. Pairing braces with a plain skater skirt are one of the most sought-after looks, when it comes to street style. For a more flattering look, pick a top in a solid color or a patterned style. Are you fed up of wearing the same office attires every week? Adding suspenders can actually spice up your tailored look. Don’t worry about how to match suspenders—when it is about work, opting for suspenders in muted tones is highly recommended. When it is a weekend or a day off when you want nothing, but lounging around with friends; incorporate oversized staples like baggy boyfriend jeans and an oversized sweater. For suspenders, you are free to make your choice—be it the colorful straps draping your body or the ones in neutral shades, both are acceptable. 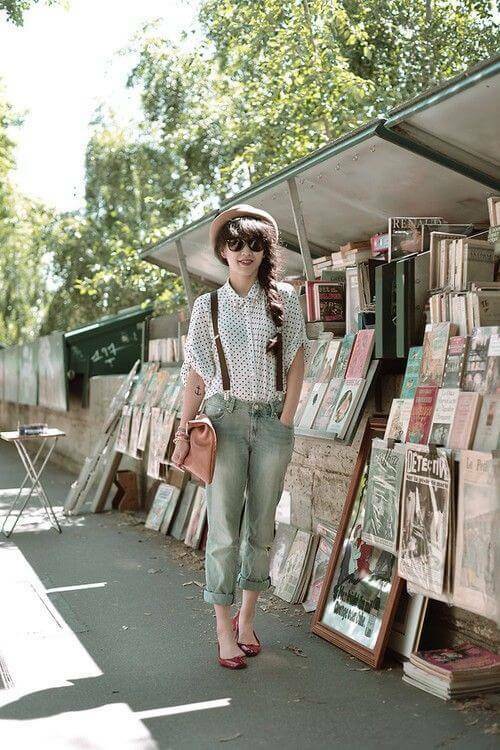 For a look both comfy and fashionable, pair up your suspenders with wide legged pants. The combo promises a neat and classy look. For colder days when besides fashion, you are also supposed to brave the weather, try a maxi skirt paired with suspenders. Match the color with your clothes or get the braces in contrast—both ways would give a cute look. 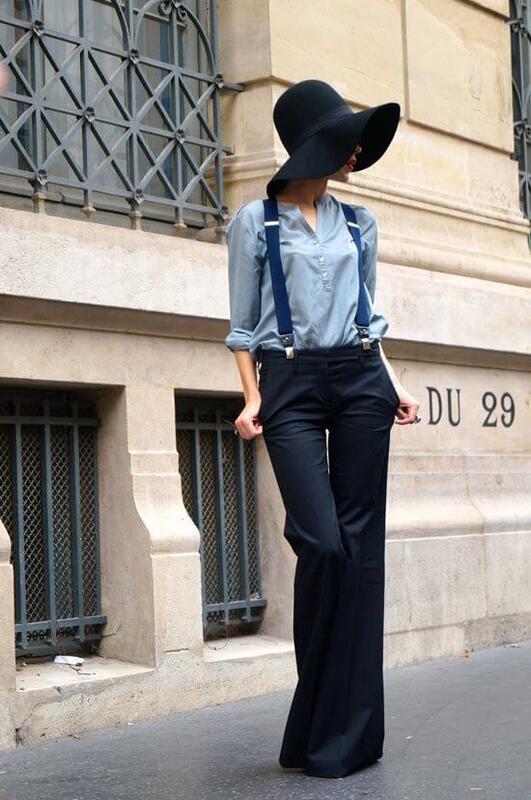 Suspenders give a rocker style look when paired with high-waisted pants. They promise an elongated look for petite girls or ladies with thick legs. How to wear suspenders hanging down on one or both sides? Another query that fashion-forward girls are keen to know. Suspenders hanging down from the shoulder is just a style that gives a fun loving and funky look. The suspender is a timeless style sensation and it is going to be around for many years to come. So, invest in this fashion accessory freely. And lastly, don’t forget to accessorize yourself with a delicate necklace and eye-catching earrings—it would help in balancing your look so that you don’t look too masculine. How to Style with Classy and Timeless Little Black Dress? Missprettypink Is Your Source For What Matters To Women Now, From Outfit Ideas And Makeup Tutorials To Living A Stylish, Well-Rounded Life. See Expert Fashion Advice, Star Hairstyles, Beauty Tips, How-To Videos And More. Missprettypink.com is a participant in the Amazon Services LLC Associates Program, an affiliate advertising program designed to provide a means for sites to earn advertising fees by advertising and linking to Amazon.com Amazon and the Amazon logo are trademarks of Amazon.com, Inc. or its affiliates.